The turmoil in the Middle East shows little sign of ending in the near future, and the potential lack of enough cheap fuel for the population is a warning that the levels of unrest may continue and even get worse. There is, however, some hope for enough local supply in the near term to help with some of the indigenous problems. Consider, for example, Egypt which has the largest population of the countries in its immediate vicinity, a population that has grown 200% in the last 50 years. By last December Egypt was populated by some 83.66 million folk, with little sign of change in the growth rate. 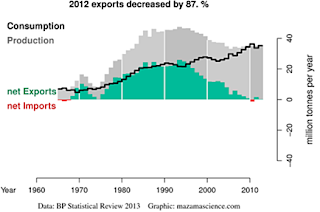 Over that time, energy demand has grown, while domestic supplies of fuel have not kept up. The most significant change, perhaps, is in oil consumption, with recent data, as previously noted, showing that the country has now switched to one that must import oil to meet demand. 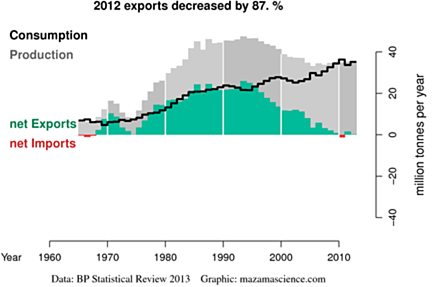 The EIA puts consumption at 811 kbd, set against a production of 555 kbd of petroleum products and, for natural gas, the country produced 2.1 bcf , which can be set against a consumption of 1.8 bcf, but the balance there also is trending downwards as recent levels of discovery and development have failed to match the increase in domestic demand. 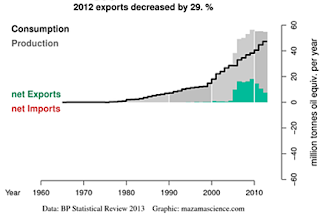 The developing need for oil imports is made more difficult by the subsidies that have become an accepted part of the Egyptian economy, including not only fuel, but also bread. Fuel subsidies are reported to be at around $17.4 billion and about a fifth of total state spending. Bread subsidies though a similarly critical part of picture, run only at about 20% of the fuel cost. To help manage costs and encourage domestic production, the Morsi government had cut back on foreign purchases of wheat, but this has now been reversed with the take-over even as the new government works to transition away from the subsidy burden. With the change, foreign governments are now also more willing to provide fuel, the United Arab Emirates (UAE) will send around a million barrels of oil this month, and Kuwait, Saudi Arabia and the UAE are promising more aid packages. This may help with the short–term problem, which has too many political entanglements to allow any solid predictions for longer term help from outside the country, but there are potential sources of increasing domestic supplies from both the Western Desert and the Nile Delta itself. Egypt has been supplying natural gas to Jordan, Syria, Lebanon and Israel through the Arab Gas Pipeline with flow starting in Arish, and the leg to Ashkelon being underwater. Because of the connection to Israel the pipeline has been the subject of a number of terrorist attacks (the latest a couple of weeks ago) . 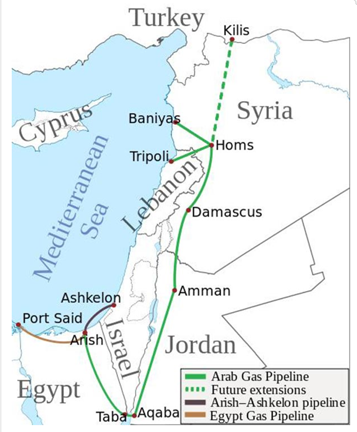 However these more often affect the flow of gas to Jordan, rather than to Israel, because of the pipeline locations, with the pipeline being vulnerable in the Sinai where it is flowing south to Taba. This problem has led Jordan to consider importing natural gas from Israel and the recently found offshore natural gas deposits being developed in that country. Flow from the Tamar field started on March 30th tapping into the estimated 8 Tcf therein, while flow from Leviathan is anticipated in 2016. The possible presence of oil-bearing strata at a lower depth in the Levant Basin has led Noble to plan an offshore well to go down 31,200 ft to a potential field holding perhaps as much as 1.8 billion barrels of oil. However Noble estimates the chance of success at 25%. 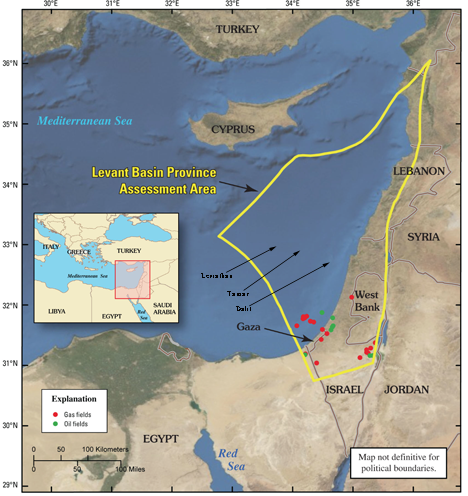 The recent success in finding these resources within the Levant Basin suggests that the potential for other discoveries in future years, with significant possible impacts on the local economies. The problems limiting future exploration in the region tie in with the conflicts and internal disruption that seems to spread to most of the countries in the above map. But in the more immediate short term Egypt is reducing exports in order to meet the growth in domestic demand, while importing natural gas, currently as a gift, from Qatar. In the longer term, as the Israeli fields come on line, it might be possible to change the direction of flow of the Arish-Ashkelon pipeline to carry Israeli gas into Egypt. There are thus potential technical solutions to getting fuel to Egypt to meet their growing need. However this does not address the underlying problem of how Egypt is going to be able to pay for that fuel (not to mention the bread). Even with a potential glut in global natural gas prices, without a stable economy Egypt is not going to be able to pay its import bill. This was evident towards the end of the Morsi government, when a lack of cash, or hard credit made it more difficult for the country to assure itself of enough imported oil to meet demand. The continued turmoil will keep away the tourists that could provide the economy with enough funds, while the lack of international recognition of the current regime is currently keeping the IMF from providing any help. Yeah, in fantasyland. In the real world, as far as we know, no member of the French royal family ever derided the people’s need for bread. Before North Sea oil, one of Aberdeen's primary exports was colloquially known as "potted heid" -- smart Aberdonians went out into the world and made good. These days, there are countries like the Phillipines, Pakistan, Bangladesh, Nepal, even Mexico that are heavily dependent on exported labor sending much of their meager earnings back to relatives in the mother country. Egypt has already moved part way down that road -- as Arabic-speaking Muslims, educated Egyptians are well-placed to earn a living in the petro-states of the Arab/Persian Gulf. Since internal conflict is a sure way to cut the tourist trade, Egypt's rulers may have to look at boosting the numbers of Egyptians who work abroad. Plan B for Egypt would be military action to expand national income & pay for food imports. Seize control over the very generous international funds flowing to the much less numerous Palestinians. And/or seize the oil production capacity of underpopulated eastern Libya. With 80 million people, Egypt could easily overwhelm any local opposition. And with Russian support, an impotent Europe, and a feckless US Administration, there would be no effective international opposition to Egypt doing what had to be done to feed its people. Plan B is the one that has me worried, since sabotage would only get worse, and potentially lead to a disaster.